#dollarstorebargains Rosette from Fmaily Dollar and headband from Dollar Tree. Ring from Clothing Warehouse in now-closed Savannah store. Purple multichain bead necklace handmade by me. 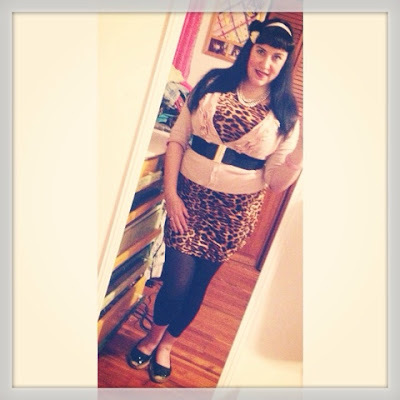 How to Wear a Wiggle Dress for Your Plus Size Pin Up Easter Sunday Outfit: Add Ruffles to Your Leopard Print! I've worn this leopard print bodycon dress from SammyDress.com a few times. Without the cardigan and belt over it, it's a lot sexier and form fitting. But I think with the leggings and cardigan over it, it tones that aspect down and makes it a very nice dress for work or, in this case, for Easter dinner. The pretty soft pastel pink accessories and accents make it a softer outfit, especially with my super lovely and sophisticated Aunt Betty's pretty pink costume pearl necklace that matches the cardigan so well. 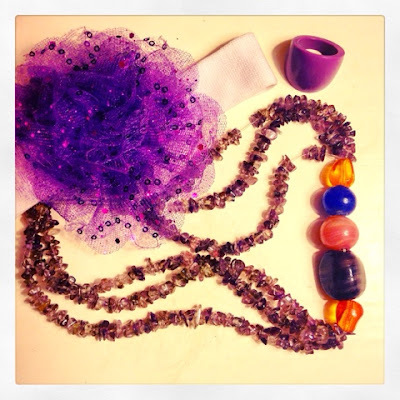 It's a balance of fun with sweet and makes for a very pretty outfit. Who Do We Talk to about Making Official Retro Style Sports Gear for Women? instead of, you know, "pink hats"
Authentic pin-up style pro sports gear doesn't exist yet, but it really should. Wouldn't you love that? Sports apparel in the team colors, but with pinup touches? Like a cap sleeve zebra print Bruins tshirt with gold spoked B! 1940s female baseball uniform, a la "A League of Their Own," as a Red Sox dress! Patriots hair rosettes! 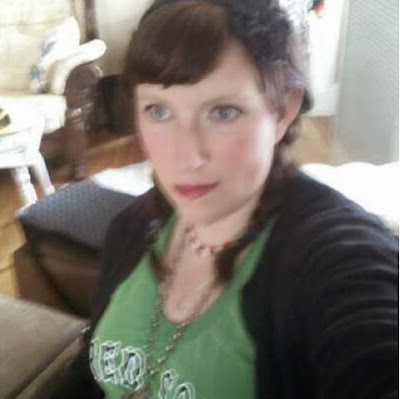 Celtics cardigan with clovers instead of polka dots! (That was very Boston-centric, but it's my fantasy, so when in Rome...plus why not go with teams that are historically the best? =gloat gloat=) In the meantime, we are left to improvise. I do what I can to fashion my sports fan style in a vintage way. 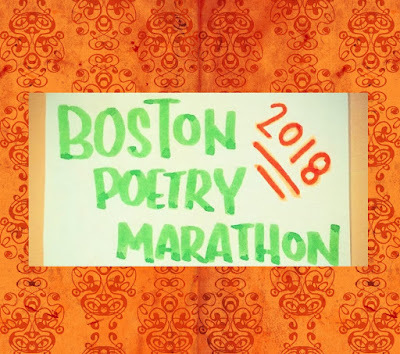 The First Tentative Schedule for the Boston Poetry Marathon 2018 Hello Folks! I present to you the Boston Poetry Marathon 2018 Schedule (tentative, expect changes!!!). This labor of love was a mix of my organizational acumen and knowledge of poet people, as well as some alchemical magic of some sort. Don't get me wrong though, I love being an organizer for the Boston Poetry Marathon. We were literally overwhelmed in your enthusiastic interest in participating, so we had to expand our hours! We will start at 6pm on Friday, instead of 7pm and at 11am on Sunday instead of 12pm. Even with the extra time, we were not able to include all the poets who have not participated in the past but showed interest. However, we encourage everyone to attend the event, if they can, even though we were unable to extend an invite to them at this time. It is such a great time of year to hear good poems and meet good poets. Vintage Bridge Style: Swimsuit Edition - swimming is my faovrite activity, and I'm here to affirm that all bodies are swimsuit ready!